There are three states of being. Not knowing, action and completion. Accept that everything is a draft. It helps to get done. to get other things done. Doing something makes you right. internet, that counts as a ghost of done. I think it is a powerful idea. I can’t say I follow every bit of it really, though I see its power. Taken in the context of Pettis’ life at that time it makes sense. He was making videos including weekend projects for Make: and had been doing for a few years. In regular video making and especially for makers who make and THEN make a video about it, Done really is the Engine of More and I can relate to this absolutely. At face value I can see that someone might think it’s about rushing and making shoddy work. It really isn’t about that though. Such an influence on me has been this manifesto that I decided to label the past month of blogging as “Engine of More” because to get this book in motion I need to have more writing done. Without having some ideas drafted out into words, it is not going to happen. The Good - What went well? I’ve had some really positive engagement on my writing. I’ve been pleased to be able to get something written and shared on a daily basis for a whole month. I’ve had on average about 30 readers purr post and some of the ideas, especially the posts about 5S, seem to have hit a nerve on social media. I am finding that I’m working through my ideas and coming up with better ways to present and share them all the time. The Bad - Needs to be worked on. I’m also seeing that my style would benefit from a few revisions, something that doesn’t 100% nest well with the Cult of Done or my #Makevember type philosophies. I’m a dyslexic so I really do struggle with spelling and grammar, hopefully this hasn’t come across. I’m also fairly verbose as you’ve likely noticed, and often my writing is a little too conversational. I also liberally distribute commas into my work where they don’t really belong. Oh and yes I use 100 words where 6 would do. All this needs to be worked on. The Ugly - Not sure how to fix. The first one is a constant feeling of imposter syndrome. Whenever I go to a space or meet people in the movement I get utterly overwhelmed by how intelligent and seemingly grounded and real they are. I’m generally teetering on a knife edge of feeling completely wrong about most things, combined with a ridiculous sense of justice and duty. This means I’m prone to pick fights over small matters of ideal. I need to learn to stop doing that. The other problem I have is that I don’t feel I reach the audience I want to influence, probably the sort of energetic young entrepreneurial types I’m thinking of when I write don’t really need help from the likes of me, which of course, is a source of bitterness no doubt. My suspicion is, and this is always a worry with my work, that those who engage with it, are not the audience I seek to serve. I’m reminded of satirist who portray right-wing characters (especially Steven Colbert and Al Murray) only to find their fan-base becomes the very people they sought to lampoon. This is unfair of me, and no doubt if you are reading this now, you should not see yourself in that characterisation. I suspect all these outcomes and even the internal dialogue that goes with them are beyond my control and I should push on regardless. If my writings can inspire one person to make a slightly better hackerspace, then it’ll have been worth it. I’ll be continuing but will likely start to use the pre-fix The hackerspace architect. I’m also going to try a 2 step process. Writing on the day before and revising quickly before publishing. As even I appreciate any feedback you might have for me. I’m very open indeed to deep critiques of my writing and writing style, discussions on my approach and on my world view. I want to also extend thanks to those who’ve spoken with me about hackerspaces face-to-face and I also want to apologise, I have so much to say on the topic I know its difficult to shut me up and that I don’t spend enough time listening back to what you have to say. 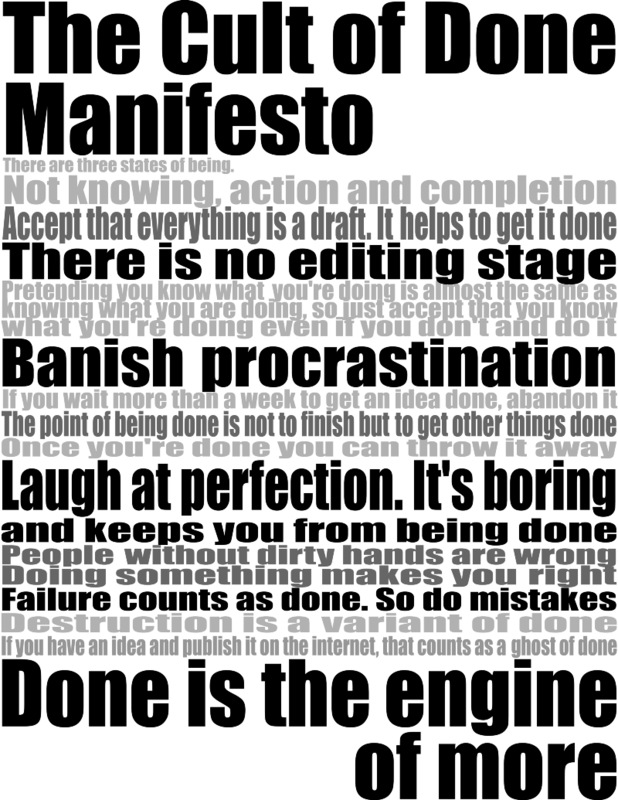 Here is a nice picture of the Cult of Done Manifesto.